Minus the Bear is an American indie rock band formed in Seattle, Washington, in 2001, and comprising current and former members of Botch, Kill Sadie and Sharks Keep Moving. Their sound has been described as "Pele-esque guitar-taps and electronics with sophisticated time signature composition." Minus the Bear has released six albums and four EPs. The band consists of Jake Snider (vocals, guitar), Dave Knudson (guitar), Cory Murchy (bass guitar), and Alex Rose (synthesizers, vocals). On 2 January 2006, Matt Bayles, keyboard player and producer for Minus the Bear, announced that he would be leaving the band to focus all his time on his career as a producer. His last performance with the band was on 28 January 2006. He was replaced by Alex Rose, who previously worked as a sound engineer on the band's second full-length album, Menos el Oso. Interpretaciones del Oso, an album of remixed songs from their second full-length album Menos el Oso, was released on 20 February 2007 by Suicide Squeeze Records. The band's third full-length album, Planet of Ice, was released on 21 August 2007 by Suicide Squeeze Records, and contains ten tracks. As well as an exclusive iTunes bonus track titled "Cat Calls & Ill Means", a bonus CD containing two B-sides, "Electric Rainbow" and "Patiently Waiting", a demo version of "Ice Monster", and a remix by P.O.S. of the album's first single, "Knights", was released with the album's first edition. In 2008, the band recorded four tracks live on Daytrotter that were released for free with a membership to the website. Later that year, the band also released an acoustic EP, Acoustics, which contained an unreleased track, "Guns & Ammo", and acoustic versions of six previously released tracks. On 27 October 2009, the band released a two song single, "Into The Mirror", on various digital music outlets; exclusive 7" vinyl copies were sold on tour. On 17 February 2010, Dangerbird Records announced that it had signed Minus the Bear and that it would distribute the group's next release. A week later, it was announced that the album was titled Omni and that it was scheduled to be released on 4 May 2010. On 8 May 2010, Minus the Bear was the first band to be featured on RadioVA and was interviewed by David Lowery. On 5 August 2010 Minus the Bear opened for fellow Seattle band Soundgarden, in their pre-Lollapalooza warm up show at the Vic Theatre in Chicago. On 9 January 2012, the band began recording a fifth full-length album with the producer and former keyboard player, Matt Bayles. An announcement on their Facebook page on 30 April 2012 said that the new album had been recorded and that it had been sent off for mastering. On 21 June 2012, Dangerbird Records announced this album, Infinity Overhead, would be released on 28 August 2012. On 29 June 2012, Minus The Bear announced rollingstone.com the release of the first single from Infinity Overhead, entitled "Lonely Gun". On 10 July 2012, it was announced that Minus the Bear would be joining the Big Scary Monsters record label in the UK and that Infinity Overhead was to be released on BSM in September 2012. On 10 July 2013, Minus the Bear announced that they would release Acoustics II, a ten-track LP with eight acoustic versions of old songs and two new tracks. An acoustic version of "Hooray" was given to everyone who pre-ordered the album. To celebrate the tenth anniversary of the They Make Beer Commercials Like This EP, the band played two small shows in the early part of 2014 on the west coast of the USA. That summer, the band announced a new full-length compilation album entitled Lost Loves. The LP was released in both vinyl and CD form and contains music which did not seem to fit in a sequential order appropriate enough, at the time, to be put on a full-length release. The tracks "Invented Memory" and "Lucky Ones" were the only tracks that were unavailable before the release of the compilation. The latter was made available before the album's release through SoundCloud and on the band's official web page. The band toured in support of the new EP and continued the celebration of their Beer Commercials LP in the second half of 2014. On 29 January 2015 the band officially announced via its Facebook page, that the drummer Erin Tate was no longer a member of the band. "It is with heavy hearts that we regret to inform you that due to personal and creative differences Minus the Bear and Erin Tate have decided to part ways," signed by Dave, Jake, Cory, and Alex. The band then talked about future tours, and continuing to work on the follow up album to Infinity Overhead. The band's 6th album, "Voids," was released on March 3, 2017. 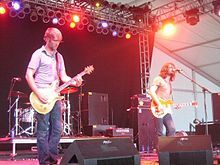 The name "Minus the Bear" comes from an in-joke among the band members, referring to the 1970s television series B. J. and the Bear. "A friend of the band had gone on a date," explained the singer-guitarist Jake Snider, "and one of us asked him afterwards how the date went. Our friend said, 'You know that TV show from the '70s, B.J. and the Bear? It was like that... minus the Bear.' That’s the straight truth." ^ a b "Minus the Bear - Friends, It is with heavy hearts that we...". Facebook. 2015-01-29. Retrieved 2017-04-01. ^ Ambrose, Anthony. "inTuneMusic Online: Minus the Bear / Tim Kasher / Twin Tigers @ NYC 12/4/2010". Retrieved 6 March 2011. ^ "Minus the Bear". Suicide Squeeze Records. Archived from the original on 27 October 2007. Retrieved 3 November 2007. ^ "MTB prep new album, remix CD out Feb. 20". Minus the Bear News Page. Archived from the original on 21 January 2007. Retrieved 26 January 2007. ^ "Torn Out Of The Scene, A Room Suddenly Cold, Hot And Empty". Daytrotter. Retrieved 2 July 2008. ^ "Minus the Bear, Into The Mirror". Filter. Retrieved 5 October 2009. ^ "Dangerbird Welcomes Minus the Bear". Dangerbird Records. 17 February 2010. Retrieved 18 February 2010. ^ "Minus the Bear Release Date". AbsolutePunk.net. 22 February 2010. Retrieved 22 February 2010. ^ "Minus the Bear Infinity Overhead Coming August 28th on Dangerbird Records". 21 June 2012. Retrieved 21 June 2012. ^ "Security Check Required". Facebook. Retrieved 2017-04-01. ^ "Minus the Bear - We're beyond excited to announce our 6th...". Facebook. 2017-01-11. Retrieved 2017-04-01. ^ "Minus the Bear". Spin. Retrieved 16 March 2010.